Ford Fusion has incredible tech features in spades. The Fusion's tech features and its eco-friendly energy usage make it one of the most popular mid-size sedans. We here at West Herr Ford Hamburg appreciate all of the Fusion's tech features, so we picked two features we think you might like to know about. Using SYNC 3, Ford's infotainment system, you can incorporate your Android phone or iPhone into the Fusion's in-cabin tech. SYNC 3 interfaces with Apple CarPlay, Google Now and Google Music, giving you hands-free access to Siri and Google. Make hands-free calls and send hands-free messages. Access Apple Music or Maps as well as voice-navigation, traffic info and estimated travel time. 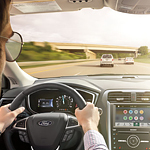 Fusion comes with FordConnect, a system that creates an in-cabin Wi-Fi network that supports up to 10 devices simultaneously. The network has a 50-foot radius, and delivers 4G LTE speeds powered by AT&T. See FordConnect in action today. Visit our Ford dealership and enjoy a test drive.